Angle conversion converts between different angle measurement units. Angle conversion tool helps to quickly convert various angle measurement units. The most common ones include degrees, gradians, radians and turns. Angle conversion calculator calculates them in any settings in real time. Degrees are used to measure a plane angle and represent 1/360 of full rotation. They are fairly easy to convert to turns as one turn equals 360 degrees (so a full circle). Degree to radian conversion requires using a calculator as 1 radian equals 1/2π. The close estimation of this value in degrees is 57,296°. Another, not so common but still frequently used unit is gradian. 1 gradian equals 1/400 of a turn or 9/10 of a degree. 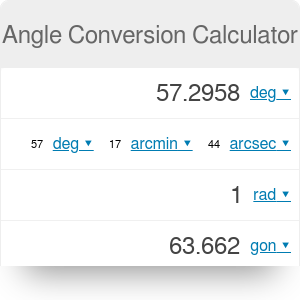 Angle Conversion Calculator can be embedded on your website to enrich the content you wrote and make it easier for your visitors to understand your message.